The Shiv Sena ruled out any alliance with the Bharatiya Janata Party (BJP) for upcoming Lok Sabha Elections 2019. However, it said that it will extend its support to Nitin Gadkari, if he emerges as the PM face. शिवसेना प्रमुख उद्धव ठाकरे और मुख्यमंत्री देवेंद्र फडणवीस. 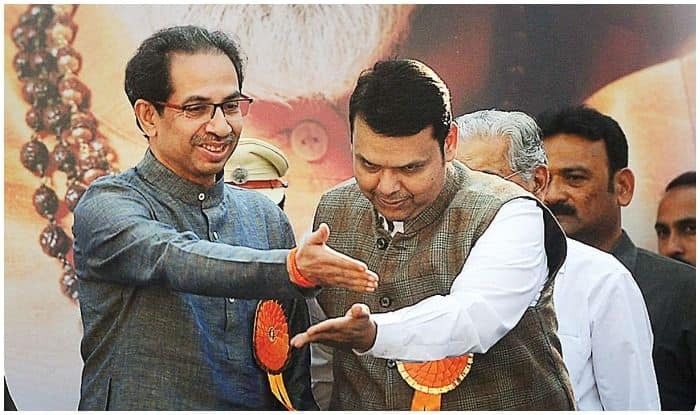 New Delhi: The Shiv Sena ruled out any alliance with the Bharatiya Janata Party (BJP) for upcoming Lok Sabha Elections 2019. However, it said that it will extend its support to Nitin Gadkari, if he emerges as the PM face. Speaking to an English newspaper, Sena leader Sanjay Raut predicted a hung house in the general polls and said that the BJP only thinks about itself which is why ‘we are also thinking about ourselves’. The leader yet again made it clear that the word ‘alliance’ does not exist in Sena’s dictionary. However, he asserted that the party will support Gadkari if he comes out to be the PM face. The BJP, on the other hand, is leaving no stone unturned to work towards making Narendra Modi country’s prime minister again in 2019. Gadkari, himself, asked party workers at the BJP national convention, to take a resolution to work with all their strength and bring BJP to power and Narendra Modi as prime minister. This is not the first time that the Sena has hit out at the BJP despite being part of the government in the state and the Centre. At several occasions, its leaders have often said they would contest the upcoming polls on their own. Both the parties have been at loggerheads since many months. Earlier this month, the BJP ally supported the Opposition demand in Lok Sabha for a joint parliamentary committee (JPC) probe into the Rafale issue. On the other hand, Amit Shah, in a veiled warning to the Sena, had said that if an alliance is forged, the party will ensure victory for its allies, but if it did not, the party will defeat its former allies in the upcoming Lok Sabha polls. “Party workers should get rid of confusion about (prospects of) alliance (with the Shiv Sena). If the allies join us, we will ensure their win, or else will defeat them too (“patak denge”). Party workers should start preparations at every booth,” the BJP president had said. Despite being in alliance at the Centre and in Maharashtra, the Shiv Sena shares an uneasy relationship with the BJP. The two parties contested the 2014 Maharashtra polls separately but later joined hands to form government in the state.